This month we’re launching a new section of the magazine aptly called “Looking Back” dedicated to looking back at POLICE Magazine’s long history. The publication started in 1976, and needless to say much has changed in law enforcement since then. This month, we’ll look at January issues from 10, 20, and 30 years ago. Long before calls to drain the swamp, law enforcement officers were apprehensive about President-elect Barack Obama's plans. 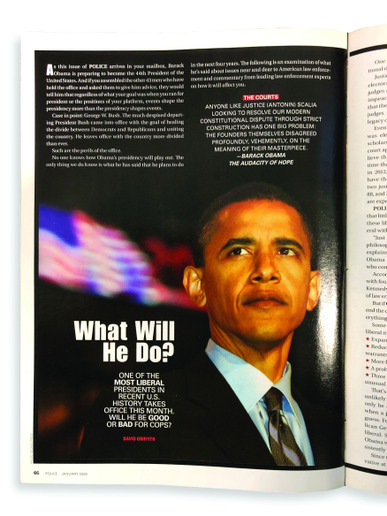 2009: What Will He Do? Long before calls to drain the swamp, law enforcement officers were apprehensive about President-elect Barack Obama’s plans. Worries included Obama putting liberal justices on the Supreme Court; being soft on crime; and instituting gun control, counter-terrorism, and immigration policies that would adversely affect law enforcement officers. We now know how all of that played out. 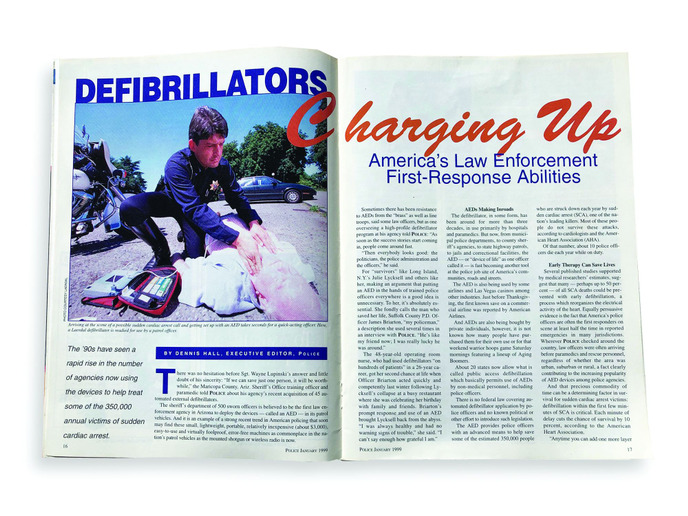 The cover story for January 1999 discussed law enforcement agencies beginning to acquire, and train officers to use, automated external defibrillators (AEDs). 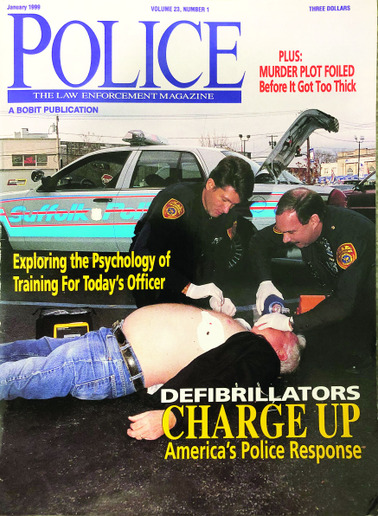 The cover story for January 1999 discussed law enforcement agencies beginning to acquire, and train officers to use, automated external defibrillators (AEDs). Before then the devices used to jumpstart a heart had been mostly relegated to use by hospitals and paramedics (not yet referred to as EMTs). The article cites the Maricopa County (AZ) Sheriff’s Office as the first known law enforcement agency in Arizona to deploy AEDs in its patrol vehicles. Today, AEDs are available in many public places, and newer models are made to be much easier for even someone with no training to use. But they are not everywhere, and law enforcement officers are still often the first on scene when someone suffers a sudden cardiac arrest. Many agencies still struggle to pay for enough devices to equip all their patrol vehicles, as well as replacing outdated models. The article discusses the reality that you can't know by looking at someone if they have AIDS, so it's important for officers to wear gloves and other protection on calls when coming into contact with any bodily fluids or rendering medical aid through resuscitation. Back in January 1989, it had only been eight years since the first reported cases of AIDS in the United States. Coming in contact with people who had AIDS or were HIV positive was a relatively new and growing concern. The deck reads, “As the threat of AIDS grows to potentially epidemic proportions, public safety workers must learn to protect themselves.” The article discusses the reality that you can’t know by looking at someone if they have AIDS, so it’s important to wear gloves and other protection when coming into contact with any bodily fluids or rendering medical aid through resuscitation. And of course needles are to be handled with care. While certainly not the same, it’s easy to draw parallels with the current opioid epidemic and the precautions that law enforcement officers must take to protect themselves from exposure through contact with these substances. Officers may not know when they arrive at a call if the people they interact with are drug users, dealers, or transporters who may have opioids on their person or in their vehicles.